First, a keyboard shortcut for Chinese to English. This may seem surprising to many Westerners, but there are an estimated 400 million people learning English in China. To make the weight of that number obvious, there are more people learning English in China than there are people speaking it in the US and UK combined. While not all students master it, all students are required to learn English, starting usually in primary school and continuing through college. Suffice it to say, there are a lot of people switching from Chinese to English on keyboards in China. Every single computer I’ve used in China has had, not just an English keyboard installed, but a 3rd party one that allows for faster and better switching. Presumably, Apple’s new system makes the process better (though I don’t have the beta & can’t comment on that directly). Second, improved pinyin predictions. This is HUGE. Absolutely HUGE. The Chinese language is, as you’re likely aware, a character-based language, with over tens thousand of distinct characters. While Macs enabled input by writing the character stroke-by-stroke, most people use a system called pinyin that writes words out phonetically with roman characters. So, for example, if I wanted to enter the characters for “China,” for example, I would type “zhongguo,” which is the pronunciation of the word, and then choose the appropriate characters (中国). The problem is that, in pinyin, there are 70 different characters spelled “zhong” and over 70 spelled “guo.”1 Now, not all of those can be combined and so the system is smart enough to only give seven suggestions of that combination (plus emoji! ), and will sort them by frequency of use. If the first one is what you want, you merely hit the spacebar and it will insert it. If it isn’t, then you use the arrow keys or number keys to choose whatever character(s) you wanted. Ideally, the algorithm always determines what character you want and lists it first so you can enter it with a spacebar, barely slowing you down. In reality, Apple’s algorithm is terrible. It’s not so bad for the very basic Chinese I type, but it frustrates my wife to no end. In fact, most Chinese people I know have installed 3rd party system keyboards with better character algorithms. This was one reason why enabling 3rd-party keyboard on iOS was so important for Apple to localize in China. I’m hoping this is much-improved, as it was desperately needed. 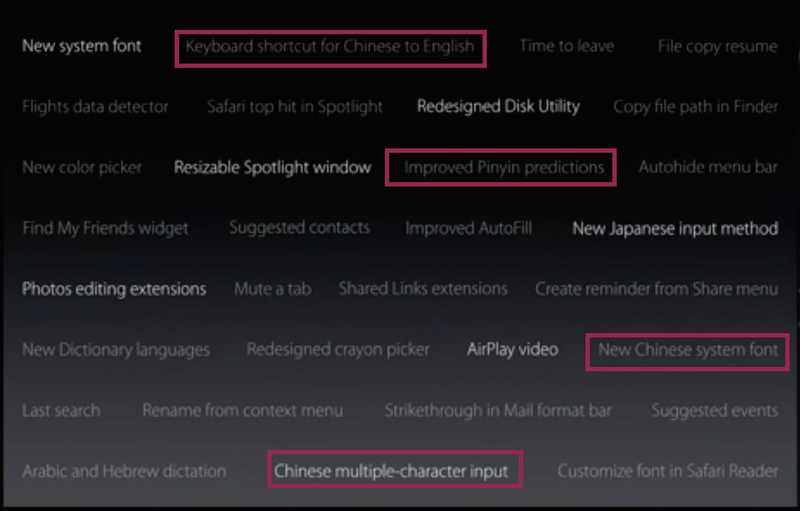 “New Chinese System Font” in the OS X feature slide! Finally STHeiti is consigned to the dustbin of history! Fourth, multiple-character Chinese input. For those who do want to write Chinese characters stroke-by-stroke on the keyboard, you previously had to do this one character at a time (SLOW!). The new system should improve that tremendously. The US has ten cities with a population over 1 million. China has 171. The US has 34 cities with a population over 500,000. China has 450. In 2014, China had 62M vehicles of all kinds registered, in a country of 1.3 billion. This is expected to reach 200M by 2020. 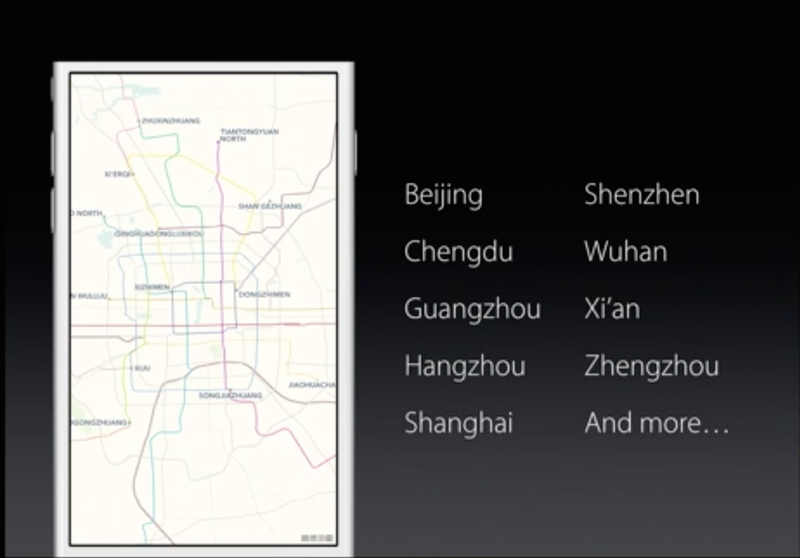 Apple developed transit directions for just 10 cities in the non-China world, but over 300 cities in China. The non-China cities for which Apple has transit directions have a combined population of about 38M. Just the 9 listed cities in China have a combined population of over 130M. Second, improved battery life & reduced OS upgrade size. These upgrades do not exclusively benefit China, but they were important upgrades in China. In the last years, as I’ve talked with non-Apple users in China, the number one reason they bought another brand was because of screen size, which Apple addressed with iPhone 6/6+. The number two reason was poor battery life. Apple getting an extra hour of battery life was important; getting 3 more hours in battery savings mode is huge for the hundreds of millions of people who commute on public transportation without a power source. Reducing the size of the OS upgrade, likewise, is important for China and the developing world where the phone is often the only computer. When I didn’t have enough free space to upgrade, I could just upgrade via iTunes on my Mac. For many iPhone users in China, for whom iPhone is their only computer, that was never an option. There are a lot of people still on iOS 7 in China as a result. Second, in the demonstration, Lynch showed off three apps: VW, WeChat, and Vine, but spent far more time in WeChat than in any other app, demonstrating two new SDK features in it. With thousands of apps in the App Store, Apple could have showcased any app they wanted, and they did WeChat. This is not a surprise, seeing as it is the largest stand-alone messaging client in the world, with 549 million users spending an average of 40 minutes a day in the app. It is the primary way Chinese people communicate. In fact, it is so important that, if a phone (or watch) didn’t run it, Chinese people would choose a different phone. The importance of China to Apple has been noted by many, and it was once again on full display in this latest event. Apple has been increasingly China-focused and China-savvy, not least in their brilliant pricing of Apple Watch. Many foreign companies have struggled to enter China, but Apple has succeeded, in no small part due to Tim Cook’s understanding of and involvement in China. As a result, Apple has taken every opportunity it can to localize for the Chinese market. This WWDC wasn’t the first event, and it won’t be the last. For more, you can subscribe to markdmill.com via RSS, Tumblr, WordPress’ email form, or by following MarkDMill on Twitter. Each week, I feature someone’s Watchscreen. This last week was the screen of Kane Cheshire, creator of MacID, one of my favorite apps for iPhone & Apple Watch. 2. Curiously, it was Weibo, which is not nearly as significant or popular in China as WeChat, which appeared on the person’s homescreen but wasn’t opened in the video. Update 6/15: I suspect the reason Weibo was shown, not WeChat, was because Apple wanted to spend more time highlighting WeChat in the demo than less than a second in the video. Next > Get MacID for free! One thing I wanted to add was that I read that all of Chinese public transport is on one API so Apple were able to implement one city and ‘get the rest free’ this is part of how they were able to do so many cities in China. Great thoughts, Lewis. I didn’t know it was just one API, but that makes sense to me as it was Apple’s integration of Autonavi data that allowed them to do this for China. As to app localization, you’re dead right that it’s important. https://twitter.com/MarkDMill/status/594170942437351425 — and great suggestion for the future. You can manage you localisation files without the need to think about which version of the app you’re updating. You also don’t need to recompile the app each time you add a new language.